Its only a 10min drive from Bethlehem. The dirt-road leading up the hill is blocked by big rocks moved there by the Israeli military. The scenery is dominated by settlement row houses on the nearby hilltops. We exit the car and walk the rest of the way up the hill. Getting closer we spot some tents and a greenhouse hidden by fruit and olive trees. A barbed wire fence surrounds the property. Despite the surreal scenery Daher Nassar is welcoming us with his warm voice and a friendly smile. 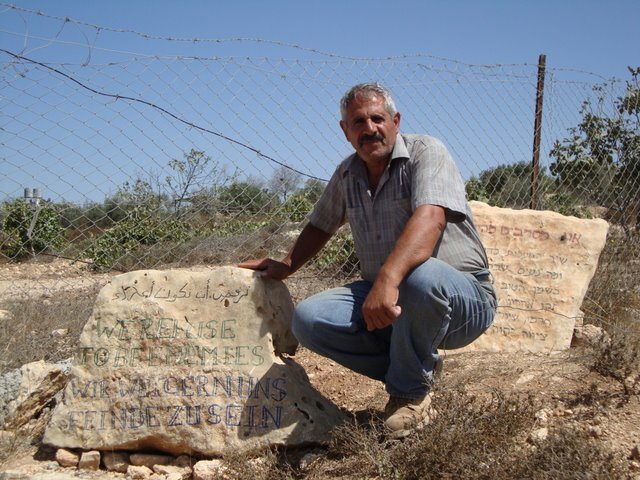 „We refuse to be enemies.“ A sign in arabic, hebrew and english letters greets the visitors on their way to the orchards on the hilltop. 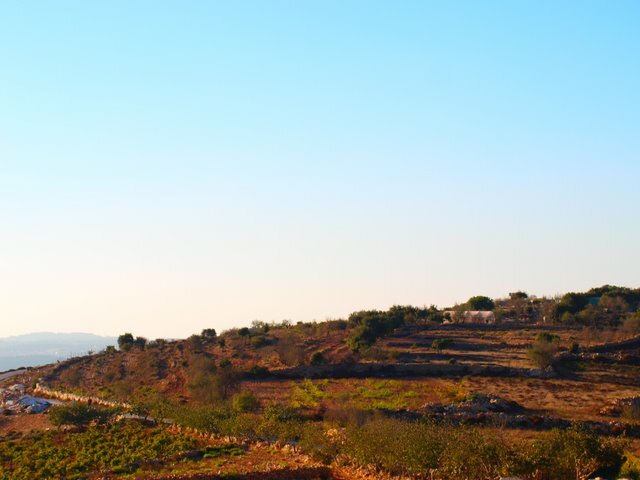 The sentence outlines the vision as well as the daily struggles of this place located between Israeli settlements and challenged by demolition orders and the denial of property rights by the Israeli authorities. The Tent of Nations aims to provide a save refuge for youth exchange programs and summer camps, for reconciliation projects and peace education courses. “People building bridges” – states the slogan. Daher and his brother Daoud Nassar developed the project in the name of their father Bishara who saw the need of a place of hope, understanding and tolerance in an environment of mistrust and violence. “We have to offer a vision and our support for the next generation or we risk them getting lost”, explains Daher while leading us around the property. The land, about 42 hectares of fertile soil, belongs to his family since his grandfather bought it in 1916. “But since twenty years now”, Daher continues, “they try to take it from us.” In 1991 Israel began to dispute the property rights of the Nassar family. They went to the court and could prove their ownership with the documents of the Ottoman Empire, as well as the papers of the British and the Jordan authorities. But the court denied to accept the proves. “The court is just postponing the decisions, always asking for something new, like additional documents or maps”, Daher said. And so far the family paid more than $140.000 for lawyers and process costs. The Tent of Nations is surrounded by settlements from every side and counts as the last hill between Jerusalem and Hebron not yet occupied. 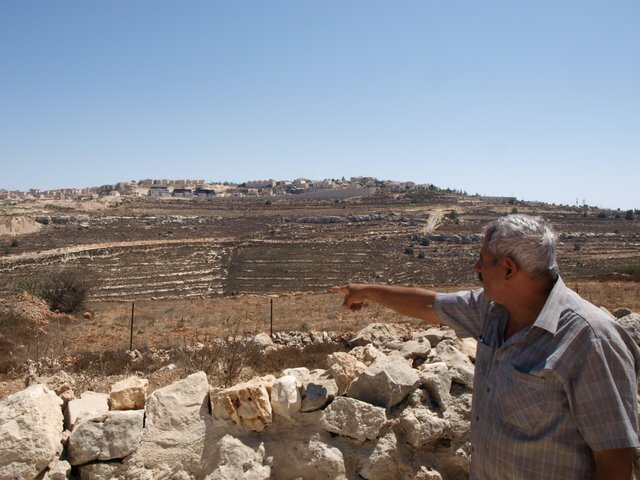 The settlements belong to the strategic settlement project Gush Etzion reaching from Jerusalem into the West Bank, dividing it into a northern and a southern part. In several situations settlers tried to take over the land or parts of it. They offended the Nassar family, threw rocks at them and even threatened them with guns. 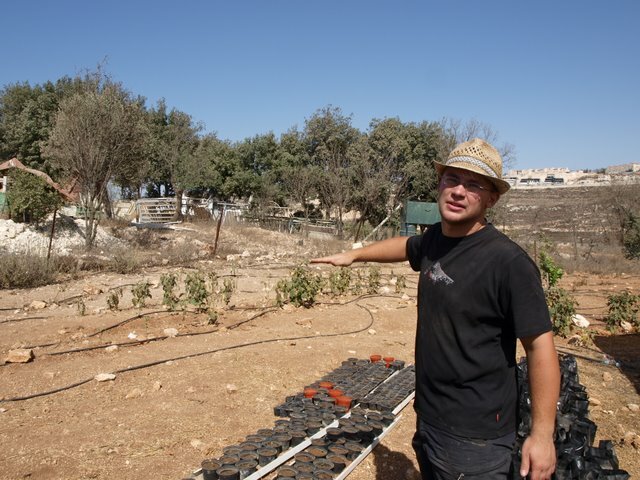 Several years ago they cut down 250 olive trees to instal an outpost at the edge of the property which today still exists and is guarded by the Israeli army. But Daher does not want to give up. 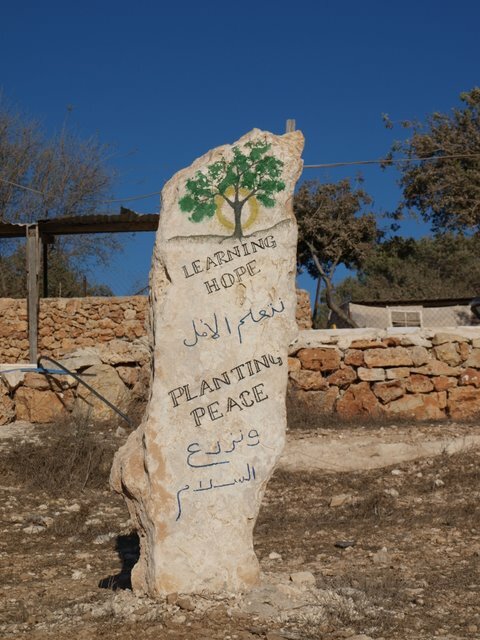 So far they already replanted five-hundred trees with the help of international donors as well as Israeli peace groups. Visitors can donate 50 NIS, about 10€, for the planting of one tree. For every tree that got destroyed Daher plans to replant five. With its activities Tent of Nations tries to save the property from the expropriation and at the same time aims to support reconciliation and mutual understanding between Palestinians and Israelis. This year 80 children came for summer school and youth camps; in different groups Christian and Muslim Palestinians as well as Israeli Jews and Internationals came together for reconciliation projects and peace education; in the nearby village Nahalin the Tent of Nations provides computer courses and hundreds of visitors, very often with tour groups, came to learn more about the project, the conflict and the daily life in the area. During the summer about 25 volunteers stayed from a couple of days to several month to support the Tent of Nations with planting trees, digging cisterns or taking care of the animals.